In October, the B.C. government celebrated a decision by private-sector investors to proceed with LNG Canada, a $40 billion infrastructure project in Kitimat to export “natural” gas. Yet somehow much of the media coverage neglects to mention that this gas is extracted by hydraulic fracturing, or fracking, which is now the primary method for natural gas production in Canada. Why are so many media and government announcements studiously avoiding the “F” word? There is nothing natural about fracking, which involves drilling a shaft up to four kilometres down into rock, then several more horizontally for up to three more kilometres. Large amounts of water, sand and chemicals are injected under high pressure into the rock, cracking and fissuring it to release gas deposits. During its lifetime, each fracking well consumes more than 90 million litres of clean water - the volume of 36 Olympic-size swimming pools. In fact, in parts of the United States drinking-water wells have dried up due to withdrawals for fracking. Some of this water, sand and chemical slurry remains underground, while a proportion of it comes back up to the surface and must be dealt with. Much of it is stored in frack ponds that are similar to tailings ponds from mining, which risk leakage, and overflow after strong rains. Many of these chemicals such as benzene and cadmium are known to cause harm to human health, while otherslack toxicity data. Research has also documented cases of clean water contamination from the fracking process. In summary, we are injecting a mixture of harmful and unstudied chemicals into the earth, using a process that risks contamination of clean water sources. Fracking also releases pollutants and carcinogenic chemicals into the atmosphere. Studies demonstrate an increase in asthmaand other respiratory diseases in people who live close to fracking operations, with higher rates of hospital admissions for heart, cancer, skin, nerve and bladder disease found nearby. More babies born with congenital heart defects and higher rates of pre-term births have also been observed among those who live close to fracking sites. Most research on the health impact of fracking has only been published in the past seven years. However, the majority of published studies associate fracking with water contamination (69 per cent), air pollution (87 per cent) and other harms to human health (84 per cent). This is especially concerning in B.C. because fracking takes place in the northeastern part of the province, which is largely inhabited by rural and Indigenous communities who already face a disproportionate number of health challenges. Some argue that fracked gas has a smaller carbon footprint than coal when it is eventually burned to produce energy. However the extraction and transport process itself involves leakage of significant and difficult-to-measure amounts of this type of gas (called methane)- into the atmosphere.Furthermore, methane is now recognized as a “super pollutant”, with 84 times the greenhouse-gas warming potential of carbon dioxide over a 21 period, leading to near-term warming risks. On October 8, the Intergovernmental Panel on Climate Change reported that global net human-caused carbon dioxide emissions need to fall by 45 per cent from 2010 levels by 2030 to keep climate change, termed the biggest global health threat of the21st century by the World Health Organization, within safe boundaries. It is clear that the next few years are the most important in history for our governments to enact policy to reduce greenhouse gas production—and expansion of fossil-fuel infrastructure has no place in this plan. 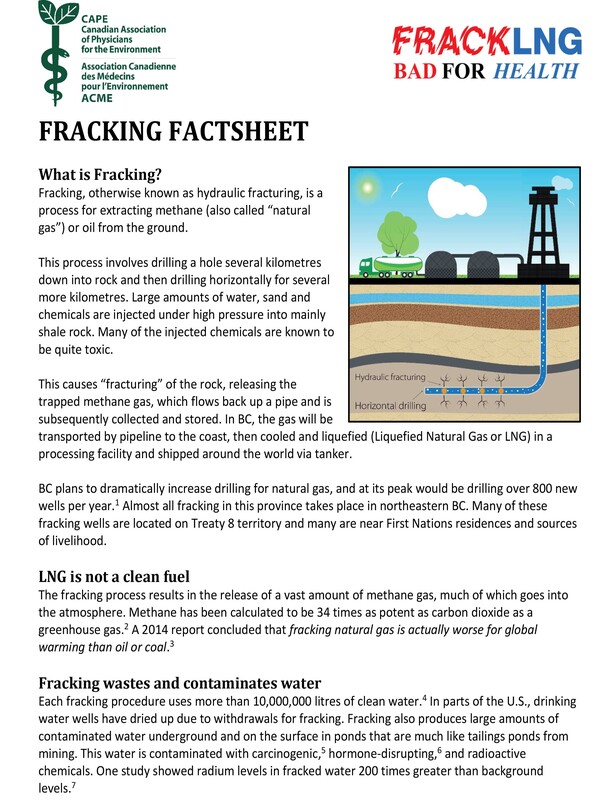 Liquid natural gas is fracked gas. Failing to factor the “F” word into our discourse on LNG does a great disservice to our collective ability to understand the overall health and environmental issues at stake.